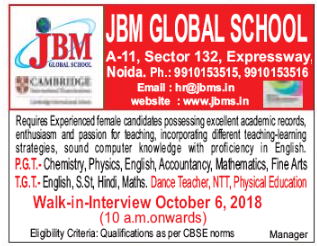 JBM Global School, Noida has advertised in THE HINDUSTAN TIMES newspaper for the recruitment of Teachers- PGT / TGT / NTT / PET jobs vacancies. Interested and eligible job aspirants are requested to walk-in on 06th October 2018. Check out further more details below. About School: Established in 2008, JBM Global School has fast grown on the path of progressive and quality education. JBM Global - one of the best boarding schools in Noida. The main focus of the staff is to equip the students ethically, technically and to face the challenges of ever changing global environment, provided with 10 acres of land, centrally air-conditioned and with 24×7 power back-up. We practice a balanced integrated approach towards scholastic and co-scholastic areas of the school. How to Apply: Interested and eligible candidates are requested to attend the Walk-in interview by bringing their bio-data along with recent passport size photos and supporting documents to the walk-in address provided below.